A collection of two new stories from cartoonist and Adventure Time contributor Sam Alden. In "Household," a brother and sister deal with divergent memories of their father and grow closer than ever. In "Backyard," vegans and anarchists share a house, small dramas and bizarre transformations (featuring a new, never before published ending). 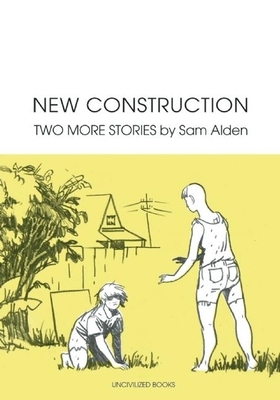 Designed as a companion volume for the critically acclaimed It Never Happened Again, New Construction cements Sam Alden's reputation as one of the best cartoonists of his generation. Sam Alden Sam Alden is the author of It Never Happened Again, Wicked Chicken Queen, and Lydian, among others. He is a two-time Ignatz winner and four-time nominee, and works full-time as a writer and storyboarder on Cartoon Network's Adventure Time.